In the previous post in this series, I made note of an interesting but significant sentence in Genesis, Chapter 3. Did you see that?! Wow – I love this Scripture, because it shows us, right from the start, that it is our Lord and Creator who does the work to save us. We are unable to work our way back to God, but once we allow Him to clothe us, to cover our sin, we can begin to live for Him. In Genesis 2:15-17, the first human has already been warned by God that death is the curse resulting from disobeying God’s command. And really, it’s not as if God gave humans a difficult list of rules. There was only one: “you must not eat from the tree of the knowledge of good and evil.” (Genesis 2:17a, NIV) Notice that it does not say “don’t eat apples” or any other fruit. My understanding is that this was a unique tree, no longer in existence, as the Garden of Eden would probably have been destroyed in the Flood (Genesis 7:20-24). There is a curse that comes from rejecting the Creator. He is the source of all life, and to cut Him out of our lives is to choose death over the life offered by the One who created us. Let’s look at a few relevant Scriptures. You are encouraged to read these in a translation of the Bible that you find easier to understand. There are a variety of Bible translations available online at http://bible.crosswalk.com/ and heaps of bookstores selling Bibles. See below for a small list of Australian-based Bible stores online. But Christ being come an high priest of good things to come, by a greater and more perfect tabernacle, not made with hands, that is to say, not of this building; Neither by the blood of goats and calves, but by his own blood he entered in once into the holy place, having obtained eternal redemption for us. For if the blood of bulls and of goats, and the ashes of an heifer sprinkling the unclean, sanctifieth to the purifying of the flesh: How much more shall the blood of Christ, who through the eternal Spirit offered himself without spot to God, purge your conscience from dead works to serve the living God? And for this cause he is the mediator of the new testament, that by means of death, for the redemption of the transgressions that were under the first testament, they which are called might receive the promise of eternal inheritance. For where a testament is, there must also of necessity be the death of the testator. For a testament is of force after men are dead: otherwise it is of no strength at all while the testator liveth. Whereupon neither the first testament was dedicated without blood. For when Moses had spoken every precept to all the people according to the law, he took the blood of calves and of goats, with water, and scarlet wool, and hyssop, and sprinkled both the book, and all the people, Saying, This is the blood of the testament which God hath enjoined unto you. Moreover he sprinkled with blood both the tabernacle, and all the vessels of the ministry. And almost all things are by the law purged with blood; and without shedding of blood is no remission. It was therefore necessary that the patterns of things in the heavens should be purified with these; but the heavenly things themselves with better sacrifices than these. For Christ is not entered into the holy places made with hands, which are the figures of the true; but into heaven itself, now to appear in the presence of God for us: Nor yet that he should offer himself often, as the high priest entereth into the holy place every year with blood of others; For then must he often have suffered since the foundation of the world: but now once in the end of the world hath he appeared to put away sin by the sacrifice of himself. And as it is appointed unto men once to die, but after this the judgment: So Christ was once offered to bear the sins of many; and unto them that look for him shall he appear the second time without sin unto salvation. Therefore being justified by faith, we have peace with God through our Lord Jesus Christ: By whom also we have access by faith into this grace wherein we stand, and rejoice in hope of the glory of God. And not only so, but we glory in tribulations also: knowing that tribulation worketh patience; And patience, experience; and experience, hope: And hope maketh not ashamed; because the love of God is shed abroad in our hearts by the Holy Ghost which is given unto us. For when we were yet without strength, in due time Christ died for the ungodly. For scarcely for a righteous man will one die: yet peradventure for a good man some would even dare to die. But God commendeth his love toward us, in that, while we were yet sinners, Christ died for us. Much more then, being now justified by his blood, we shall be saved from wrath through him. For if, when we were enemies, we were reconciled to God by the death of his Son, much more, being reconciled, we shall be saved by his life. And not only so, but we also joy in God through our Lord Jesus Christ, by whom we have now received the atonement. Wherefore, as by one man sin entered into the world, and death by sin; and so death passed upon all men, for that all have sinned: (For until the law sin was in the world: but sin is not imputed when there is no law. Nevertheless death reigned from Adam to Moses, even over them that had not sinned after the similitude of Adam’s transgression, who is the figure of him that was to come. But not as the offence, so also is the free gift. For if through the offence of one many be dead, much more the grace of God, and the gift by grace, which is by one man, Jesus Christ, hath abounded unto many. And not as it was by one that sinned, so is the gift: for the judgment was by one to condemnation, but the free gift is of many offences unto justification. For if by one man’s offence death reigned by one; much more they which receive abundance of grace and of the gift of righteousness shall reign in life by one, Jesus Christ.) Therefore as by the offence of one judgment came upon all men to condemnation; even so by the righteousness of one the free gift came upon all men unto justification of life. For as by one man’s disobedience many were made sinners, so by the obedience of one shall many be made righteous. Moreover the law entered, that the offence might abound. But where sin abounded, grace did much more abound: That as sin hath reigned unto death, even so might grace reign through righteousness unto eternal life by Jesus Christ our Lord. What does this all have to do with Christmas? Well, it points to the very reason that Jesus came. The blood of an innocent, a sacrificial Lamb, for example, must be shed to pay the price for our disobedience to God. The problem is that no one is free of sin – we have all inherited sin from our ancestor, Adam, humanity’s representative who chose death and disobedience over a relationship with Creator God. Who, then, can die for a man’s sin when no man is free of sin? Animal sacrifices were – for want of a better term – like a ‘band-aid solution’ to the problem. An elaborate system of sacrifice worked in the meantime. But when God comes to Earth in the form of a Man, in the Incarnation, Jesus becomes the one truly sinless Man. Now, I must admit that I am at a loss for words to describe what it means exactly. I am not a theologian and I won’t pretend to be. So, I will over the posts to come in this series, also provide links to information written by those better qualified than I am who have explored the question of the Incarnation. The Incarnation, by the way, is simply a fancy sounding word referring to God the Son coming to Earth in the form of a human being in order to suffer the penalty for human sin. That penalty being death. In suffering death He defeated death. If that has left you more confused, you might want to read C.S. Lewis’ The Lion, the Witch and the Wardrobe, the second book in the Chronicles of Narnia. Now I say, read the book – the recent and very successful movie, while certainly being very exciting, I feel missed the theological depth of Lewis’ story. Read the book, keeping in the back of your mind the concept that Aslan is like a figure of Christ, and I think it makes a really interesting and enlightening interpretation of the Gospel stories of Christ. Questions and Answers about the Trinity, http://creationontheweb.com/content/view/3008/#trinity. ‘The Cleansing Blood,’ (2007), Dr H. Morris, http://www.icr.org/article/3215/. Is Jesus Christ God? http://www.christiananswers.net/q-eden/edn-t005.html. “First Adam – Last Adam,” (1998), http://creationontheweb.com/content/view/200. ‘Why is Christianity such a bloody religion?’ http://www.gotquestions.org/Christianity-bloody.html. ‘Why did God require animal sacrifices in the Old Testament?’ http://www.gotquestions.org/animal-sacrifices.html. All links in this post accessed 26 September 2008. What happened to God’s beautiful Creation? A summary of the story is found in the Bible at Genesis, Chapter 3, which I will include here from the King James Version. However, it’s themes of disobedience to God, choosing sin over God’s presence, carving our own way, rejecting our Creator – why, these themes are through the whole Bible. In a sense, these are the themes entwined throughout human history. What is known as the Fall involves, simply put, the first act of willful human disobedience to God. And Adam, being God’s representative on Earth, effectively hands the authority God had given him to the Devil. The Devil, likewise, also started out as one of God’s good creations, but the story goes that the Devil, once a beautiful angel, decided he wanted to receive the worship that God alone deserves. So he, and his minions, were cast out of God’s presence and are sometimes known as “fallen angels,” “Demons” and other various titles. So, how does an angry fallen angel get back at the Creator? He hits Him where it hurts. The Devil targeted God’s special Creation, the man and woman He had made in His very likeness, to represent Him to all Creation. Ouch. Most sadly, the man and woman decided that what the lying, deceiving, rebellious Devil offered sounded a whole lot better than the perfect, pristine, beautiful Creation made by loving God for His creatures. And when the woman saw that the tree was good for food, and that it was pleasant to the eyes, and a tree to be desired to make one wise, she took of the fruit thereof, and did eat, and gave also unto her husband with her; and he did eat. And the eyes of them both were opened, and they knew that they were naked; and they sewed fig leaves together, and made themselves aprons. And they heard the voice of the LORD God walking in the garden in the cool of the day: and Adam and his wife hid themselves from the presence of the LORD God amongst the trees of the garden. And he said, Who told thee that thou wast naked? Hast thou eaten of the tree, whereof I commanded thee that thou shouldest not eat? And the man said, The woman whom thou gavest to be with me, she gave me of the tree, and I did eat. And the LORD God said unto the woman, What is this that thou hast done? And the woman said, The serpent beguiled me, and I did eat. And the LORD God said unto the serpent, Because thou hast done this, thou art cursed above all cattle, and above every beast of the field; upon thy belly shalt thou go, and dust shalt thou eat all the days of thy life: And I will put enmity between thee and the woman, and between thy seed and her seed; it shall bruise thy head, and thou shalt bruise his heel. And the LORD God said, Behold, the man is become as one of us, to know good and evil: and now, lest he put forth his hand, and take also of the tree of life, and eat, and live for ever: Therefore the LORD God sent him forth from the garden of Eden, to till the ground from whence he was taken. So he drove out the man; and he placed at the east of the garden of Eden Cherubims, and a flaming sword which turned every way, to keep the way of the tree of life. Interestingly, this passage of Scripture mentions the first bloodshed. Keep it in mind. We’ll look at it in more detail in the next post in this series. “Christmas Time,” by Dr John Morris (2004), http://www.icr.org/article/22/ (accessed 25 September 2008). “The fall into sin,” by Noel Weeks (1981), http://creationontheweb.com/content/view/1457/ (accessed 25 September 2008). Read this inspirational / devotional article at: http://www.davidmccracken.org/Inspiration-Live-in-Environment.php. (Accessed 12 November 2008). Watercolour pencil on paper, 2006. Re-edit November 2008. 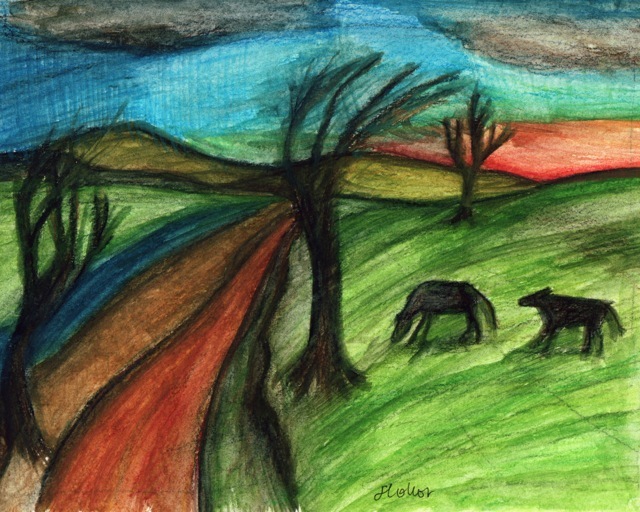 This is an imaginary scene inspired by the sunset drive home from my grandparents’ farm. I love that place so much. I used to get to visit there every weekend, as it was just outside my hometown, but these days it’s a 2 hour drive away. We try to get there at least every Christmas, which is the time I drew this illustration. Here’s some more Scriptures on Creation. What I am trying to point to here is that the Bible repeatedly affirms God as the Creator of the world and all life in it. He is the one who stretches out the Heavens. Even before the beginning, He was God. Our Lord is so great, so mighty beyond our comprehension. So often we try to limit Him in our small human imaginations. Oh, but He is far beyond that! Once again, if you have trouble understand the Ye Olde English of the King James Version, please look up these Scriptures in your preferred translation of the Bible. Of old hast thou laid the foundation of the earth: and the heavens are the work of thy hands. They shall perish, but thou shalt endure: yea, all of them shall wax old like a garment; as a vesture shalt thou change them, and they shall be changed: But thou art the same, and thy years shall have no end. The children of thy servants shall continue, and their seed shall be established before thee. For thus saith the LORD that created the heavens; God himself that formed the earth and made it; he hath established it, he created it not in vain, he formed it to be inhabited: I am the LORD; and there is none else. I have not spoken in secret, in a dark place of the earth: I said not unto the seed of Jacob, Seek ye me in vain: I the LORD speak righteousness, I declare things that are right. “What could the God of Scripture call very good?” by Dr J. Morris (2001), http://www.icr.org/article/608/ (accessed 25 September 2008). “Clay Pots” – evidence for the Creator God, http://www.everystudent.com/au/wires/claypots.html (accessed 25 September 2008). It may come as a surprise to some people, but hosing down one’s driveway is NOT a necessity! All links accessed 26 November 2008. Ok, bear with me, this is a pretty lengthy chunk of Scripture. If you have trouble reading the old style language of the King James Version (used because it is Public Domain), you may want to try a simpler version. Some that I like to use include the New International Version, Today’s New International Version, New International Reader’s Version, New King James Version, The Message (yes, I know it’s controversial! ), The Good News Translation (TEV), and, well, most of them are decent. The Latin Vulgate is good if you want to become very frustrated… before you remember you could never understand Ancient Latin in the first place. And God said, Let the earth bring forth the living creature after his kind, cattle, and creeping thing, and beast of the earth after his kind: and it was so. And God made the beast of the earth after his kind, and cattle after their kind, and every thing that creepeth upon the earth after his kind: and God saw that it was good. And God said, Let us make man in our image, after our likeness: and let them have dominion over the fish of the sea, and over the fowl of the air, and over the cattle, and over all the earth, and over every creeping thing that creepeth upon the earth. So God created man in his own image, in the image of God created he him; male and female created he them. And God blessed them, and God said unto them, Be fruitful, and multiply, and replenish the earth, and subdue it: and have dominion over the fish of the sea, and over the fowl of the air, and over every living thing that moveth upon the earth. And God said, Behold, I have given you every herb bearing seed, which is upon the face of all the earth, and every tree, in the which is the fruit of a tree yielding seed; to you it shall be for meat. And to every beast of the earth, and to every fowl of the air, and to every thing that creepeth upon the earth, wherein there is life, I have given every green herb for meat: and it was so. Whenever studying any topic in the Bible, I usually begin at the beginning. Genesis – the Creation of the World, as observed and described by the Lord God, and recorded by His servant Moses. So, what has Creation got to do with Christmas? Well, it might not be immediately obvious but I hope that as this series progresses, we will be able to peel back a layer or two surrounding it. Creation is where God forms and fills the Earth. His Word clearly defines six days in which Creation is made, and the Seventh day is a day for rest, reflection and celebration of God’s good work. And it is good. He repeatedly says it is good. At day 6 it becomes very good. What we are talking about is a perfect Paradise, a spectacular world where every human need is fulfilled. Animals live peacefully. God is good and has made a good world with the very power of His Word. Now look around. The world around us doesn’t look so good anymore, does it? So, either God didn’t make sucha good world after all, or something has gone terribly wrong. There is bad news in all this. The Good News of Jesus Christ begins in a perfect world, but that world becomes corrupted – so that even the best things are mingled with sorrow and pain, but there is an answer. For now, it is enough to meditate on the goodness and beauty and wonder of Creation. The creativity and endless love of God, whose Word is powerful beyond our imaginations. The next post in this series on Christmas 2008 will have a look at more of Creation, followed by a post that looks at the bad news – what was it that happened to corrupt the Earth? “Christian Views of Science and Earth History,” by Dr Ray Bohlin and Richard Milne, Probe Ministries. You are currently browsing the The Amalgamation blog archives for November, 2008.